On July 9, the 39-51 Red Sox trailed the White Sox 4-0 heading into the bottom of the 8th inning. Boston rallied for 3 runs in the 8th, 2 in the 9th (partially inspired by my tweet? ), and beat Chicago 5-4. The Sox have only lost once since (an annoying 3-2 defeat in Houston in which Boston actually pounded out 13 hits), and now sit at 47-52. 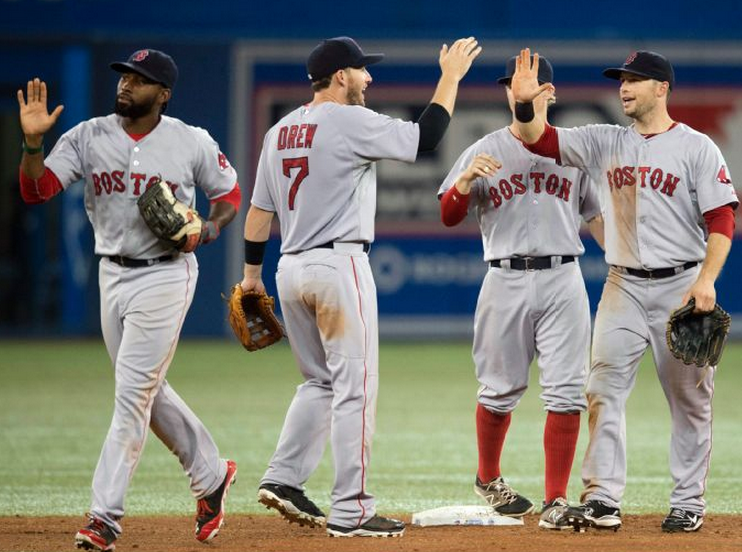 Winning 5 straight and 8 of 9 makes the Red Sox baseball's hottest team (although their fellow AL East basement dwellers down in Tampa have also won 5 in a row and 16 of 21, keeping the entire division just 8 games apart; things could get very interesting down the stretch). The Boston outfield, which was so pathetic at the plate for much of the year, has suddenly come alive (more on this in the days ahead). In each of the past two games all three Sox starting outfielders have posted at least two hits. Yesterday the Red Sox plated 14 runs in just 5 innings. Twice this season Boston went 7 full games without even scoring a total of 14 runs (May 16-23 and June 15-21). The hot streak directly coincides with the release of catcher A.J. Pierzynski and the promotion of Christian Vazquez from Pawtucket. Boston is undefeated (5-0) in games in which Vazquez has played.